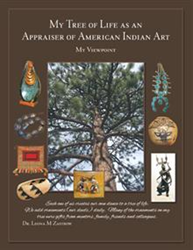 In her new book, “My Tree of Life as an Appraiser of American Indian Art: My Viewpoint” (published by Archway Publishing), Dr. Leona M Zastrow provides readers with knowledge about appraising American Indian art for donations, estates, re-sale and insurance. Zastrow offers information about federal laws and market values. Over 20 Indian artists are cited in the full-color book. From pots, vases and figurines to jewelry, bolo ties and belts, the book features color pictures of many of the types of items up for appraisal that help the would-be appraiser to understand what it is they should be looking for when viewing a specific piece. Dr. Leona M. Zastrow is the founder and president of Educational Planning for Individuals and Communities (EPIC), a company whose services include developing culturally based curricula, grant research, development, writing, evaluation, strategic planning and accreditation studies with schools and colleges. She is also the founder of The Arts and Antiques Appraisal Company, a subdivision of EPIC, which provides personal property appraisal services. Zastrow is a member of the Appraisers Association of America, specializing in appraising American Indian art. She has been a planner and researcher with American Indian nations for more than 40 years and a teacher of American Indian art to Indian high school and college students. She is also the author of a number of books and articles about Indian art. More information is available at: http://www.americanindianartappraising.com. Simon & Schuster, a company with nearly ninety years of publishing experience, has teamed up with Author Solutions, LLC, the leading self-publishing company worldwide, to create Archway Publishing. With unique resources to support books of all kind, Archway Publishing offers a specialized approach to help every author reach his or her desired audience. For more information, visit archwaypublishing.com or call 888-242-5904.